Meanwhile, I’ve been looking to see what low-hanging fruit can be plucked from the MARC tree of knowledge. The obvious place to start was the fixed-length data fields tagged as 006, 007, and 008. These have the least complicated mix of syntax and semantic, with no indicators or repeatable subfields to worry about. 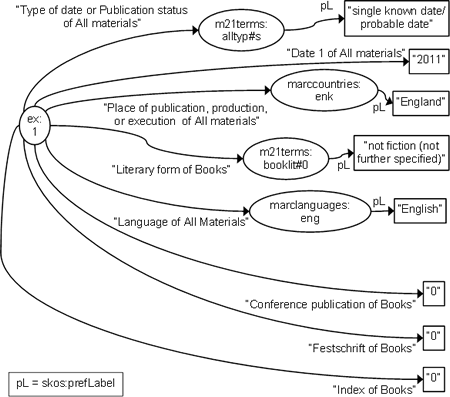 And there are value vocabularies associated with the coded content, so linked data triples with object URIs are a possibility. 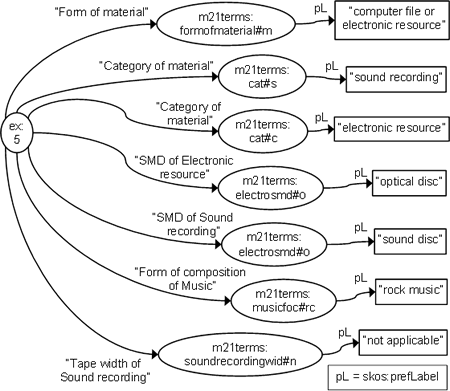 The main complication is the dependency of the codes on the category of material, recorded in the MARC21 record Leader. This introduces a decision node in the process of recasting legacy metadata as RDF triples; it determines which code sets, and therefore value vocabularies, are being used. For all level 0 elements, the property URI is constructed mechanically from the MARC21 coding, so the decision only affects the choice of value vocabulary to be used as the object of the data triple. It would be very useful if national, regional, or international cataloguing agencies could get it together to put this on their agendas, soon. Finally, notice the “0” values in ex:1 and the “not applicable” value in ex:5. The MARC21 fixed-length data fields support theOpen World Assumption, unlike the MARC/AACR record as a whole, which definitely uses the Closed World Assumption, for example by not recording a first-edition statement. I suspect when MARC bibliographic manual says “useful for retrieval”, they mean “information retrieval”, i.e. a search interface, not actual retrieval of the actual ultimate document/item.